The Wind Powered Bike Light. Taiwan designer Hsieh Jung-Ya and his firm, Duck Image, won kudos from European design comps, like Red Dot, for his concept of a wind-powered bike light. 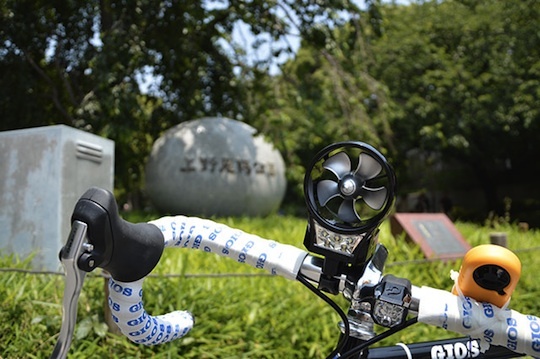 A mini turbine is mounted on the handlebars and uses the momentum of the bike to drive the blades. These in turn power a 1700 Lux LED light. A bike moving at 21kph is said to produce the continuous power of 3.5 volts at 70mA, with the little generator whizzing round at 850 revs per minute). Unlike the problem with many hubs that stop working when the rider stops, this gizmo comes with a rechargeable lithium battery for constant light. The Wind Powered Bike Light combined with gyroscopically powered LED pedals (with or without battery) this could be a groovy combination. Until that is we receive complaints from the Moth Protection Society about furry winged critters flying into the turbines path.